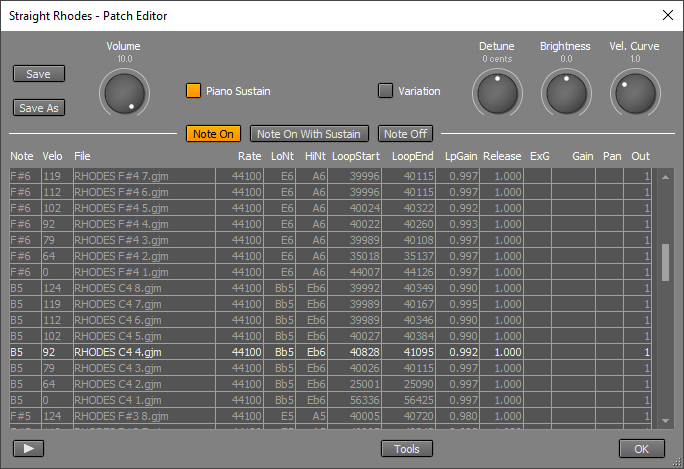 The Patch Editor allows you to modify existing patches or create new patches. A patch consists of one or more samples. A sample is an audio file containing a single note of the instrument the patch is for (for instance a single piano key hit). Samples can be triggered by three trigger sources: "Note On", "Note On with Sustain" and "Note Off". Most patches use "Note On" samples only. "Note On with Sustain" samples are used instead if the Sustain pedal is down at when the note is played. "Note Off" samples are fired when a note ends. The Match Note-Off Levels button can be used to automatically match the level of the "Note Off" sample with the current level of the playing note. The sample's Gain property determines the highest allowed level in this situation. "Note On with Sustain" and "Note Off" samples will typically be used for large piano patches. Layer: The velocity layer the sample is in. Velocity is zero on the left, and 127 on the right. The active region appears in color. A region can be activated by clicking the mouse on it. See also Layer Thresholds. Sample File: Audio file containing the sample. Can be either mono or stereo. Samplerate: The samplerate of the audio file (for instance '44100'). This parameter can also be used for fine-tuning (for instance: multiplying the samplerate with 1.0116 increases the perceived pitch by 20 cents). Lowest Note: The lowest note this sample will be used for. Use this to override the Sampler's default note-assignment rules, or to set the lowest note the patch can produce. Highest Note: The highest note this sample will be used for. Use this to override the Sampler's default note-assignment rules, or to set the highest note the patch can produce. LoopStart: The position in samples at which the loop starts. LoopEnd: The position in samples at which the loop ends. Should always be higher than LoopStart. LoopGain: The relative volume level of each consecutive passage through the loop (for instance '0.900'). If loopgain is equal to the sample's level at LoopEnd divided by the level at LoopStart a natural decay results. Excl: Exclusive Group, can be 1 or higher. Only one note can be active at once per group, so currently playing notes will be stopped if a new one arrives. This can be used to mute a hi-hat when it's closed. All parameters can be edited while the Transport is running. The Layer Thresholds control contains 15 sliders. You can drag the sliders. If your patch contains less than 16 layers you can drag any unused sliders all the way left. In general, instruments played hard produce more harmonics than they do when played soft (the 'formant' changes). The Sampler contains a special filter that mimics this behavior. This filter can be activated using the Formant Correction button. The Release control sets the time it takes to reach 60dB attenuation when a Note-Off event is received. When Discard NoteOff is active Note-Off events are ignored. This is useful for drum patches. The Brightness control controls the relative level of the sample's harmonics. Using the Detune control the patch can be exactly tuned. The Piano Sustain button makes the sustain pedal behave like it does on a piano, ie. the sustain pedal can still "catch" the sound of keys that have been released if the corresponding strings aren't fully damped yet. The Variation button will slightly change the pitch, brightness and volume level of every note. This can be used to avoid machine-gun effects when notes are played repetitively. Some real-world instruments, like piano and organ, can't really produce these pitch and brightness changes, it's probably best not to use this feature on these kind of instruments. The New Patch button loads an empty patch. The highest note (G10) samples of the "Note On with Sustain" and "Note Off" type are used for a special purpose. They are triggered by sustain pedal down and up movements respectively. They can be used to play samples of the sound a piano pedal makes.